October brings a mixture of shorter days and the start of overnight frosts. As the frosts begin keep an eye on your dahlias as the foliage will begin to blacken, when this begins they will need lifting and brining in. 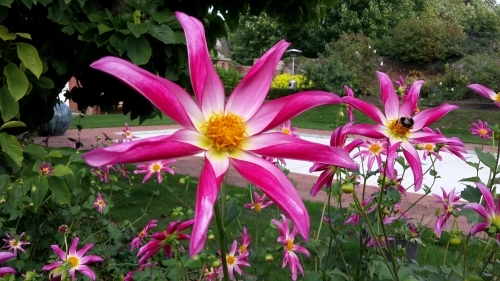 To lift dahlias the stem needs to be cut down to around 3-4 inches and it is important to remove all the soil in order to check the tuber for signs of damage or disease which could cause issues with your other dahlias if not detected. After lifting the dahlias ensure that they are left to dry for a few days before placing them in pots with bark or woodchip and stored somewhere frost free over the winter. Once the frosts have begun to ease and the spring arrives you can give your dahlias a small amount of water and bring them somewhere light and await for the new growth to appear. Continue to keep them stored and watered until the frosts have past and the new shoots appear then they can be replanted. If your soil is very free draining and dose not sit wet over the winter you may be able to mulch your dahlias and avoid the need to lift and store them. Results vary with this method depending on soil conditions, weather and thickness of mulch applied. 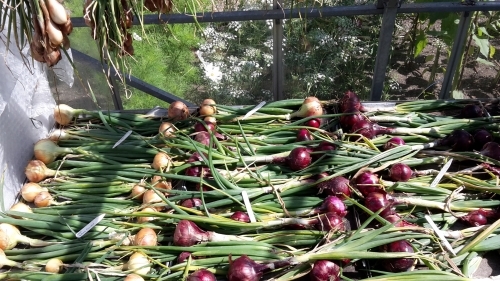 Autumn vegetables such as garlic and onions are ready to be planed now, and hope for the best next year, 2018 crop photo above. Any potatoes or carrots that you have now need to be lifted and stored along with any beetroot. Make sure you leave a small amount of soil on to help to delay the risk of decay. 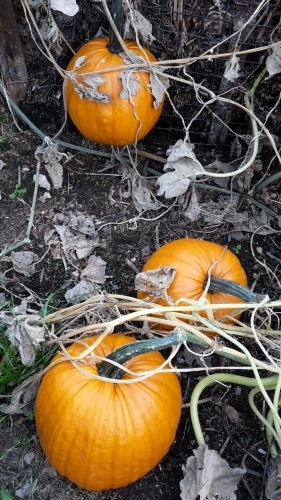 Before the Frosts start make sure you harvest pumpkins and squashes as they will quickly turn to mush if left for too long. We have had a brilliant crop of pumpkins this year. 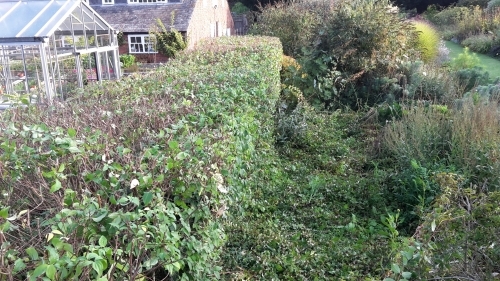 Now that the birds have finished nesting, spend some time getting hedges cut before spring returns. It is time to plant daffodil and tulip bulbs for the spring in flower beds or naturalising in grass. If you still need to complete any lawn work such as re-seeding or laying turf this will be your last opportunity. The weather will help with this as the mixture of showers and sunshine and with the soil still being warm the seed or turf should take well. Before reseeding first the lawn should be scarified, hollow tined or solid tined and finally top dress unlevel or bad patches within the lawn. Finally it is important to select the correct seed mixtures for the type of lawn required such as hard wearing or fine lawn.